Peli Cases are the No.1 choice for waterproof cases. 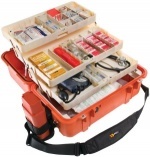 The Peli Case range offers your equipment the ultimate protection. Choose a pelicase if you need to ensure your gear gets from A to B in one piece, and be reassured by the Peli Case "no quibble" lifetime guarantee. 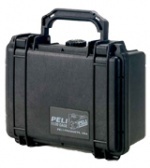 The small Peli Case range includes all models between the Peli 1120 and the Peli 1440 cases. 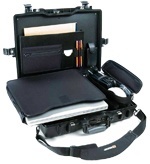 The large Peli Case range includes all Peli cases between Peli 1600 to Peli 1780 including the Peli Cube cases. 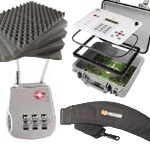 Peli Cases - Wherever you need to take your equipment you can rest assured that Peli Cases will totally protect it from water, rocks, corrosion, knocks or falls. Peli Cases have survived falls from helicopters, been rolled over from the highest mountains and have been towed along the most rapid rivers and freezing fjords, even survived the tsunami! Double step latches, Automatic Pressure Release Valve, optional "Pick 'N' Pluck" foam can be formed to your equipment's shape. Optional Padded Dividers can be adapted to different sizes with Panel Frames available for interface panels. Look in the Peli Case categories for the size that you need or alternatively, check our peli case size guide.